This is an old favourite and one that we eat often, or so I thought. It turns out we last ate it in September which is really quite a while ago. Like last time, we speeded things up again (by adding the vegetables earlier and cooking the curry for a shorter time) and it seemed not to make a lot of difference. It was hard to tell what impact it had last time since we were using old curry paste so it was good to check again. The full recipe is here. 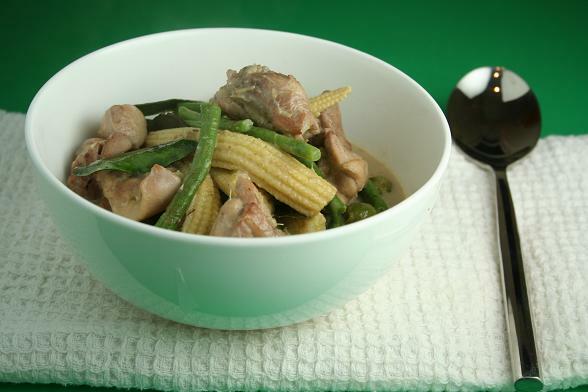 Subscribe to comments with RSS	or TrackBack to 'Thai Green Curry With Chicken'. That looks lovely Kerri, I had a Thai curry on Sautrday and had forgotton just how delicious it is! I haven’t had one in ages either. Gonna have to do something about that soon. Thanks, Hippolyra. I’d eat it much more often if it wasn’t so hard to make it look interestng and find something new to say about it! Enjoy, Sylvie. We made double the amount of paste so I don’t think it will be long before we eat it again either! That certainly look delicious or is it because of your stunning picture on all your dinner. Very nicely composed shot. I love Thai green curry. It’s been a long time since I cooked it, must do this again soon. Oh yes, I have never cooked green curry! Lovely to meet you both last night! So impressed that you make your own curry paste from scratch – a feat I have only attempted on a Thai cooking course. I think we’ll be having it again this week, Nilmandra as we have paste left. Is it on your list, Mrs E? Lovely to meet you two, GC. Curry paste can be a bit dauntng and it’s certainly time consuming but really worthwhile I think. I would say that though because Stephen generally does the bulk of it!